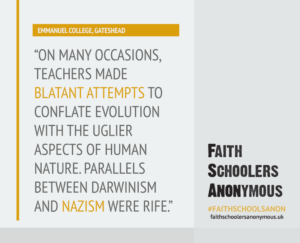 In 2002 the British Humanist Association (BHA) received complaints about alleged creationist activities at Emmanuel College in Gateshead, a secondary state school which reportedly was presenting the theory of evolution as ‘a matter of faith’. The BHA organised a letter from 43 scientists and philosophers to the Prime Minister, but at the time neither the Government nor Ofsted moved to address the concerns. Here, a former pupil who recently left the school recounts her experience of the kind of teaching that led to the controversy. Christian teaching was pervasive, and the personal beliefs of the staff were regularly aired in some bizarre contexts. A physics teacher told my class that we should remember that the red wire electrical circuit was ‘positive’ as it was the same colour as the blood of Christ. Evolution was taught in biology under duress. The staff made it clear that this part of the curriculum was delivered only because it is legal obligation. Much was made of the phrase ‘theory’; the word was abused and manipulated in an attempt to convey evolutionary science as intellectual speculation. Instead of explaining how in scientific parlance a theory is a convergence of multiple independent conclusions, it was disingenuously used as a slur. 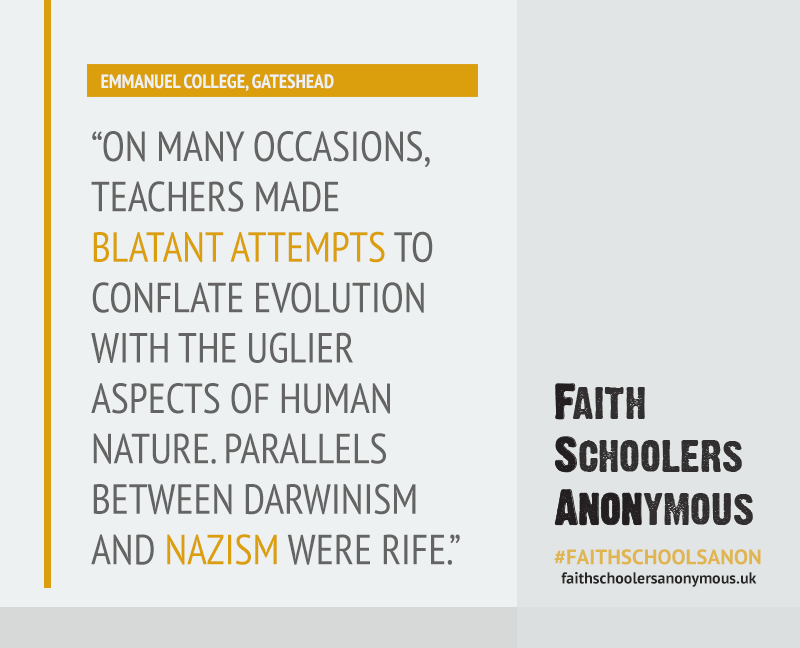 On many occasions teachers made blatant attempts to conflate evolution with the uglier aspects of human nature. Parallels between Darwinism and Nazism where rife. Their depiction of philosophical implications of accepting evolution as fact yet another act of intellectual dishonestly. Emmanuel embraced Young Earth Creationism and Biblical literalism. The events of Genesis were portrayed as historical fact; though in hindsight, they never clarified which version of the creation myth was cannon. The library was well stocked with the likes of Ken Ham, and a discredited geologist lectured on the ‘evidence’ within rock strata for a global catastrophic flood. Every day started with either an Evangelical assembly or Bible study. Sometimes the staff showed shocking naivety. One lesson focused on Ephesians 5, which commands women to obey their husbands. Subjugating 50% of the populous based on some sort of genital apartheid is God’s will, we were told. Some of us read on, uninstructed, to Ephesians 6:5, which entreats slaves to obey their masters. When one of us asked why slavery is no longer endorsed by society, we were told that this verse must be read in historical context. Why one exhortation is context-bound and the other isn’t was never revealed. Sixth form students were obligated to take a non-UCAS credited course known as PTE: Philosophy, Theology and Ethics. Ostensibly this was a mind-broadening exercise to help young people navigate a morally complex world. The reality was that it was Christian propaganda that culminated in an interview to determine our moral standing. There was little anti-Semitism, but on one telling occasion the religious studies teacher (holding a degree in theology) informed the class that Jews believe the goyem (non-Jews) are Hell-bound. Given that Judaism has little to say about the afterlife in general, this is disconcerting. Homophobia was actively practised. We were taught that to be gay was a sin that would condemn a soul to Hell. I personally had moved to Emmanuel to escape homophobic bullying in my previous school, so I already had a well-developed sense of self-loathing. Within my first term I developed anorexia nervosa; while I recovered without any lasting physical damage, I endured problems around eating and body image for 10 years after. To attribute my eating disorder to this toxic environment alone is facile, but it certainly was a significant factor.